Your PipBoy is supposed to be the one tool that provides you with ALL the vital information about the world you find yourself in. Yet on many occasions it seems to make judgement calls about what is, or isn't, of use as you try to survive in the wasteland. We've all been there, scrolling through the list of items in our inventories when, although your PipBoy tells you what it is, it gives you a picture of 'junk', as though it's saying; "why did you pick that up?". Or you see a note but nothing about the contents is shown or anything to indicate what the note actually says. Or after receiving some weapon or armour that looks just like every other piece of armour you have, you have to examine the details to determine if it is worth keeping or not. world. Additionally the icons themselves will have some descriptive text attached to add to the data you need to survive. Unique weapons or armour will tell you where, or who, it came from and what makes it 'unique'. EDIT: Above paragraphs are from the description page of the Nexus. I'm about to make my first graphics mod, well two mods actually, one for Fallout 3 and the other for New Vegas, and I'd like a few suggestions on what should be included. There are already a couple of mods that do this, Fallout 3 Item Descriptions by Mikael Grizzly, Fallout 3 DLC Item Descriptions by Blakrajder & Pipboy Item Descriptions Mod by weedking are for Fallout 3. Misc Item Icons - New Vegas by The 3rd Type and DekoMan91 is for FalloutNV, though it lacks descriptions. The problem I see with those mods though is the weedking mod covers some additional stuff that the other FO3 two don't but in my opinion it is of a poorer quality and needs some attention. Also the Fallout 3 DLC Item Descriptions mod has some glaring mistakes in its descriptions, like schoolboy spelling mistakes and some rather curious grammar. 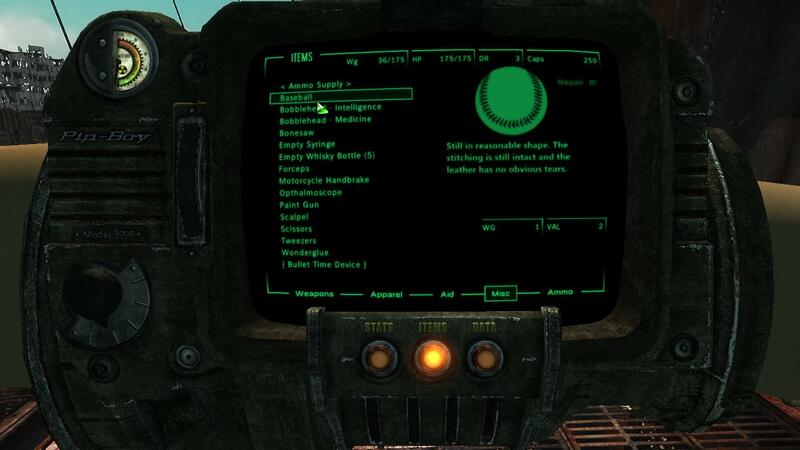 To add to that there are still a number of generic items that still have the 'junk' graphic as their PipBoy icon. So what I am going to try to do is make a new collection of textures that replaces those from the Pipboy Item Descriptions mod and include fixes of those from the other two using the same style so as to present a uniform look. Additionally I want to change all the 'junk' items to have their own specific icon and description. What I need is some input on any that stand out to you. I'm going through xEdit at the moment and noting any I see but I'm likely to miss some. This is for both the Fallout games so either is fine, so long as its clear which game we're talking about. The grand idea here is to cover every item that shows up in your PipBoy, in either game, and have it display its own unique icon and description. What do reckon, good idea or pointless exercise? Icons are always welcome as far as I'm concerned. T3T has a little icon tutorial on his page. As for descriptions, they always help. I can't think of one time where there was to much info. Maybe those descriptions for the stuff in PPA, but he made the descriptions into icons. I'd be better if every item in PPA came with a text file when you bought one of the upgrades. I'm a little surprised too as to why my bashed patch includes some of the overwrites and misses others, sometimes from the same mods. Ah well, that's probably down to user error on my part. I might leave for the time being the icons from specific mods, like PPA, for a later date. Let's see if I can pull this off first. Thanks for that suggestion though, it all comes in handy. I too can't get enough of simple descriptions with these icons. That's what your PipBoy is supposed to do - tell you about stuff. Looking forward to seeing it! I find this is a nice side effect of a good community with guide write-ups. It tends point out where the current gaps are in the available mods and inspires people to come up with ways to improve them. I think I might be finding a whole heap of errors in various mods by doing this search. However I can't see any file by that name or that location that is provided by FWE. The Unofficial Patch, including the FWE patch, also passes along this icon path but still points nowhere. As best as I can tell that icon exists only in either Fallout 3 descriptions or Pipboy Descriptions. Quick question, are you guys happy with generic descriptions that would fit for both games or would it be needed to be slightly different for each? e.g. Bonesaw: A stainless steel 12" blade that does one job very well, removing limbs efficiently. I guess you can tell which way I'd be leaning. I think descriptions that work with both games would be best and easier. You know I'm biased of course since TTW . Edited by Adonis_VII, 28 January 2015 - 02:23 AM. How could I forget TTW? For items that are common to both games, descriptions and icons that work for both games should be fine. Overall it would be great to have more items with unique icons/descriptions as well as good, succinct descriptions of items and icons that are better quality (when needed) and matched to the items. Seems like an especially useful mod . I wonder if someone can check up on something for me. Either I am going utterly bonkers or two mods that produce descriptions for the PipBoy icons are completely broken and don't/can't do what they purport to do. 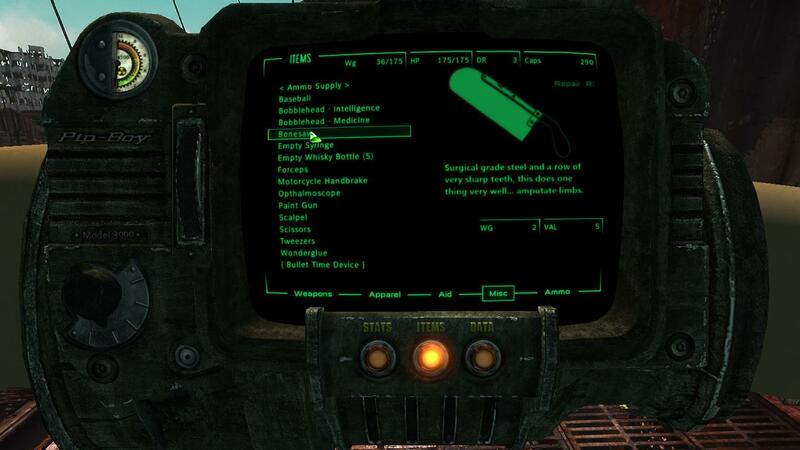 Fallout 3 Item Descriptions and PipBoy Item Descriptions are full of misnamed textures that can't be loaded by the engine because the only plugin between them, Item Descriptions Img.esp from Fallout 3 Descriptions only contains edits for the 'Weapons', nothing at all for 'items' or 'apparel'. most of the textures between them are incorrectly named and aren't replacing anything that exists in any vanilla archive. e.g. The DLC03 'BrokenSteel' has the armour called Enclave Hellfire Armor, in the BrokenSteel.bsa it is called: apparel_enclavehellfirearmor.dds. Both these mods provide the file: apperal_enclave_power_armor.dds with their own versions of descriptions for it. Fallout 3 Item Descriptions, which I'm assuming came before the other, is the only one with the plugin, but it makes no use of this texture. PipBoy Item Descriptions only replaces this texture but it has no plugin and it is doing nothing. From what I have seen so far there hundreds of similarly misspelled textures or textures that have no plugin to override vanilla assets. Am I going mad here or is this really what I'm seeing, hundreds of textures that aren't doing anything except taking up space? Nope. I'm going mad! Or at least Bethesda has a penchant for messing with people. Apparently all those misspelled textures are misspelled by Bethesda. Oh the humanity! apparel --- apperal --- apearal --- arrgghhh!! Looking for a bottle of scotch and a cosy chair, this is a brain strain. Edited by GrantSP, 31 January 2015 - 01:36 AM. There's an INI setting that is misspelled. It is one that is used for Vurt's SFO, so it's like super common too. We had to actually make not of it in the STEP guide. The Pipboy Item Description and FO3 DLC Item Description mods don't have a plugin since they just overwrite vanilla icons. The FO3 Item Description mod has some vanilla icon replacers and a plugin which is only used to change the file name for the icon texture for some weapons. The FWE mod also changes a lot of the same weapon icon textures since it includes the T3T icons, but these have no descriptions. Most of the vanilla icons have no description and are not especially high resolution. Yeah, I got that... now. Couldn't understand how all those misspelled icons were turning up, assumed a mistake by the mod authors, not Bethesda's lax quality control. Don't know if anyone is still interested, but I'm still working on this. I've taken longer than I want for a couple of reasons. I've decided to expand the reach of the mod and it now covers EVERY misc icon and quite a few extra ones. This last reason has meant I am now trying to either find or create suitable artwork to use and it isn't as easy I'd hoped. Also I've come across a collection of items that I can't recall from my playthroughs and I am unsure of the back-story of them, thus what is needed in the description. If anyone can enlighten me as to the 'Mutilated body parts'? Where they play a part? Are they specific to only one section or are they generic items? That sort of detail. Anything will be much appreciated. EDIT: I've just realised these are the contents of the 'Gore Bags'. Edited by GrantSP, 23 February 2015 - 06:48 PM. MO no longer able to load mods in any executable. Monster mod v13 ( moddb ) + immersive creatures = tescombatstyle error ? Cande Vahta fey Athel - "The Vaults"